Iowa Focus would like to recognize Craig Salts on his recent State Special Olympics first place win, taking home a gold medal. Craig is a junior at Thomas Jefferson High School in Council Bluffs, Iowa. 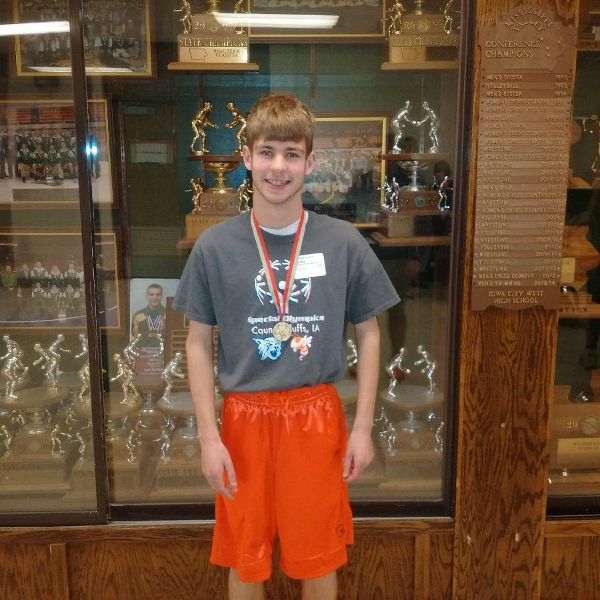 Craig was among the 1000 Special Olympics Iowa athletes that competed in the annual Mid-Winter Tournament held on March 11th and March 12th 2016 in Iowa City, Iowa. Craig participated in the Special Olympics Basketball skilled events on March 12, 2016, competing with other athletes in speed dribbling, passing, and free-throws. Craig had competed in the area Special Olympics events in January 2016, winning first place which qualified Craig to participate in the recent State events. Congratulations Craig.